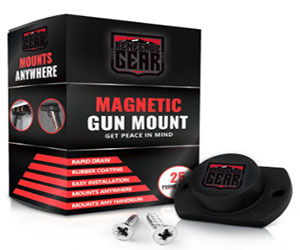 Unfortunately the "Free Renegade Magnetic Gun Mount (S&H)" offer is no longer available. The Renegade Gear Rubber-Coated Magnetic Gun Mount really does mount anywhere. It's great for desk, bedside, office, safe, wall, display case, and car. Holds up to 25 pounds and its weatherproof. Use the included screws to attach. Store your weapon safely and securely anywhere for rapid deployment. At the moment, they are giving them away for free. It's a $15.99 value. Don't delay, offer while supplies last. Just pay shipping.